Therefore, as God’s chosen people, holy and dearly loved, clothe yourselves with compassion, kindness, humility, gentleness and patience. Bear with each other and forgive whatever grievances you may have against one another. Forgive as the Lord forgave you. Colossians 3:12-13, NIV, 1984. The vessel was equipped with thirty carronades, short smoothbore cast iron cannons able to fire large shot at short range. These had been fastened below deck by triple chains and the hatches above had been shut. Now, one of the cannons had broken loose and had become something akin to what Hugo calls an “indescribable supernatural beast,” rolling, pitching, rushing, and crashing into the ship’s sides. The whole ship was now in awful tumult as the cannon, which is said to have appeared to the crew as owning “a soul filled with rage and hatred,” tears apart the insides of the ship. Hugo tells us that often, it is true, that more dangerous to a ship is a loose cannon inside than a storm outside. And what is true of ships is also true of human beings. God’s Word invites us to go “below decks” for a look at the turmoil that can result when the cannon that is unforgiveness gets loose. And it is in the Word that we will find the help needed for taming this “beast,” this “battering ram” that – left uncontrolled – can wreak devastating havoc. Perhaps we might begin by considering what acts can set the cannon of unforgiveness loose. When your mother or father fails to show up at a banquet at which you’re honored with a hard-earned award. When a tornado sweeps through your neighborhood and leaves your house in shambles. When you go into town for supplies and return home only to discover that looters have taken what little was left of your belongings. When your loved one contracts a debilitating illness that lingers on for years. Bitterness. Bitterness is what you get when you leave anger out to rot. It’s what results when injury is added to injury. It begins to root when you go to bed angry, when somebody rubs you the wrong way and the rubbing turns to chafing. It grows in the fertile fields of jealousy, abuse, and vengeance. It hangs in the air. It’s heard in the “us and them,” in the “you did this to me,” in the “he said, she said,” in the “I can’t forgive myself for….” You fill in the blank. Anger is a natural reaction to injury real or imagined. Bitterness, resentment and unforgiveness are the sins that grow out of unresolved, unhealthy anger. The antidote for these sins is forgiveness. In the gospel of Matthew, Jesus helps us understand the cost of unforgiveness as he relates the story of a king who decides one day to settle accounts with his servants. At that point Peter got up the nerve to ask, “Master, how many times do I forgive a brother or sister who hurts me? Seven?” Jesus replied, “Seven! Hardly. Try seventy times seven. “The kingdom of God is like a king who decided to square accounts with his servants. As he got under way, one servant was brought before him who had run up a debt of a hundred thousand dollars. He couldn’t pay up, so the king ordered the man, along with his wife, children, and goods, to be auctioned off at the slave market. “The poor wretch threw himself at the king’s feet and begged, ‘Give me a chance and I’ll pay it all back.’ Touched by his plea, the king let him off, erasing the debt. “The servant was no sooner out of the room when he came upon one of his fellow servants who owed him ten dollars. He seized him by the throat and demanded, ‘Pay up. Now!’ The poor wretch threw himself down and begged, ‘Give me a chance and I’ll pay it all back.’ But he wouldn’t do it. He had him arrested and put in jail until the debt was paid. When the other servants saw this going on, they were outraged and brought a detailed report to the king. So one man is brought before the king. His debt? 10,000 talents. In The Message, Eugene Peterson translates that amount to the contemporary equivalent of a hundred thousand dollars. Whatever the amount, it was clear this man was hopelessly enslaved to debt! Yet another person in the text is mentioned as owing a hundred denarii, which today would be a few dollars. The text also makes it clear that the terrible consequence of being in debt was debtor’s prison. When a bill went past due and one couldn’t pay, the creditor had the right to seize you and throw you into jail until you either rotted or paid up. But, of course, if you were in prison you couldn’t earn any money to gain your release. Your only hope might the mercy of the one who had the power to release you. Ever been in debt? In debt now? Can you remember — or do you now know — the fear, the worry? Things can look pretty bleak, can’t they? Our passage is telling us that unforgiven sin is like those unpaid debts. They weigh heavily upon us whether we’re talking about a little sin, a great big sin, or a great many sins. Each of us, like the debtors in the text, must settle accounts with the king, God Almighty Himself. And what does this free man now do? He goes out and happens upon a man who owes him a measly few bucks. He grabs him by the throat and demands he ‘pay up!’ When the debtor says he can’t and asks for patience, the man throws him in debtors’ prison. And folks who witness this go and tell the king. What does the king do? He brings the man back, chastises him for his unforgiveness and says, “Shouldn’t you be compelled to be merciful to your fellow servant who asked for mercy?” Then he has the man tossed in jail where he will sit until he repays the debt. The point of the parable is clear. If God forgives us, we must forgive others. We must forgive as the Lord forgave us. But those of us who frequent church services know this — at least on some level — don’t we? So why do so many of us have difficulty forgiving? Why do so many of us have difficulty saying two simple words: “I’m sorry?” Why do we see so little repentance for sins? Why do we see so little forgiveness in Christian circles when repentance and forgiveness are the very foundations of our faith? Amazing grace is what saves wretches such as we all. We, who have turned to Christ for salvation, have been the beneficiaries of amazing grace, amazing love. We’ve been set free. And yet too often we hold one another hostage with our own unforgiveness. As he lived within close proximity of Haggard, Cheshire contacted him to see if he would be willing to meet with him and a couple of the men from his staff. Cheshire found Haggard to be brutally honest about his failures, filled with a wealth of wisdom, deeply caring and pastoral. And Haggard had a growing church in the very city that knew him and knew about his failures; God was causing that church to grow. When other Christians learned that Cheshire had reached out to Ted, they said they would distance themselves from him if he continued to do so. Several people in his church said they would leave. He was told that his “voice as a pastor and author would be tarnished” if he continued to spend time with him. Where is the love? Where is the forgiveness? In my library is a book entitled, The Sunflower. It’s a story, written by Simon Wiesenthal, with whom you may be familiar. He is well known and well regarded for his activities in bringing Nazi war criminals to justice. 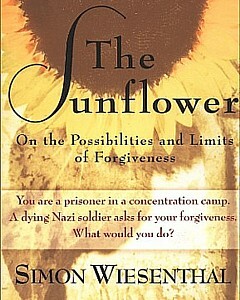 In the book, Wiesenthal tells us that he was a prisoner in the Mauthausen concentration camp in Poland. One day he was assigned to clean out rubbish from a barn that the Nazis had improvised into a hospital for wounded soldiers. Toward evening a nurse took Wiesenthal by the hand and led him to a young SS trooper. The soldier’s face was bandaged with rags yellow-stained with ointment or pus; his eyes tucked behind the gauze. He was perhaps 21 years of age. He groped for Wiesenthal’s hand and held it tight. He said he had to talk to a Jew; he could not die before he had confessed the sins he had committed against helpless Jews, and he had to be forgiven by a Jew before he died. So he told Wiesenthal a horrible story of how his battalion had gunned down Jewish parents and children who were trying to escape from a house set afire by the SS troopers. Wiesenthal listened to the dying man’s story, first the story of his blameless youth, and then the story of his participation in evil. As the man spoke, Wiesenthal’s thoughts drifted to the graves of the Nazi soldiers that he had seen nearby. Each one was decorated with a sunflower and so each one was visited by butterflies. Wiesenthal believed his place of interment would be different: a mass grave, where corpses would be piled on top of him. No sunflower for him. No butterflies for him. And some 30 years later he related the story in the book entitled The Sunflower and he ended his tale with a question: “What would you have done?” Thirty-two eminent persons contributed their answers. Most said Wiesenthal was right; he should not have forgiven the man; it would not have been fair. Why should a man who gave his will to the doing of monumental evil expect a quick word of forgiveness on his death-bed? What right had Wiesenthal to forgive the man for the sins he had committed against others? “Let the SS trooper go to hell,” said one respondent. “What is the answer to the unfairness of forgiving? It can only be that forgiving is, after all, a better way to fairness. Forgiveness brings fairness to the forgiver. It is the hurting person who most feels the burden of unfairness but he only condemns himself if he refuses to forgive. 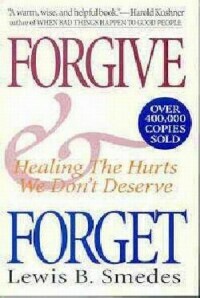 Forgiving is the only way to stop the cycle of unfair pain turning in your memory. Mining the scriptures we discover more than 100 references to the concept of forgiveness and our first lesson in these is that forgiveness is God-initiated. For the one extending forgiveness, forgiveness is to be an attitude. Forgiveness, we are told in the 18th chapter of Matthew, is to come from the heart. In the passage from Colossians, we find the commandment to forgive: “Bear with each other and forgive whatever grievances you may have against one another. Forgive as the Lord forgave you.” Be clothed with compassion, kindness, humility, gentleness and patience. Be willing to forgive. Create the climate for forgiveness. Forgive. So why do we see so little forgiveness both inside and outside the church community? 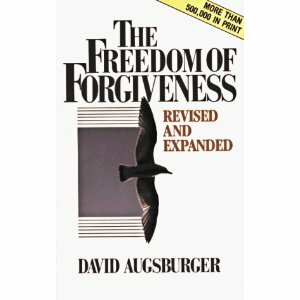 David Augsburger, in his book, The Freedom of Forgiveness, offers us some clues. He says forgiveness is rare because it is hard. It is the hardest thing in the universe. It is hard because it is costly. The one who forgives, he says, pays a tremendous price – the price of the evil he or she forgives. Forgiveness is costly because it is substitutional and this substitution was perfectly expressed in Jesus Christ. Jesus Christ substituted himself for us, bearing His own wrath, His own indignation at our sin. That’s what forgiveness costs. The sinner either bears his own guilt – that’s cold justice – or the one sinned against may absorb what the second party did – that’s forgiveness. And that’s what God did in Christ on Calvary. You will know that you are moving in forgiveness when you no longer have daily conversations, daily battles in your head, with those who hurt you. You will know that you are moving in forgiveness when you find yourself praying that those who hurt you will be blessed and will no longer have to suffer for the evil that they did to you or to others. Forgiveness can be a very slow process and, while we may come a long way in forgiveness, we may well find vestiges of bitterness many years post injury. We need to keep forgiving. Essentially we cannot forgive but, with attention to prayer and with the help of God, eventually we can. The Lord works the miracle in us as we yield to His transforming power. And we all want forgiveness for ourselves. Hemingway reports there were 800 young men named Paco who arrived that Tuesday and stood in line, waiting to see if the man might be their father who had granted them forgiveness. 800 Pacos! How many of us, if such an ad had been placed at certain times in our lives, an ad that carried our name, wouldn’t have leapt at the opportunity for reconciliation with our own fathers. Well, our heavenly Father offers that opportunity today. It is as though He has placed that same ad – the newspaper is the Bible – and when we answer and stand before Him, He is there like the father in the story of the Prodigal Son, ready to offer unmerited forgiveness – the gift of forgiveness. He delights in enfolding each of His repentant children in His loving arms. Have you called on God to forgive you? Have you faced God and told him you’re helplessly a debtor to sin and prayed for mercy? You can be let loose from your sins in Jesus. And God’s ready forgiveness stands also as an example for us in our relationships with others. Forgive as the Lord forgave you. If you’re harboring unforgiveness, harboring grudges and hatred, you’re playing with dynamite. You’re playing with fire. Just like the loose cannon in Victor Hugo’s story, unforgiveness can crash around inside you tearing your guts out, messing with your mind, tormenting you! Featured image: Antoine Morel Fatio. This one sentence hit me on the head like a hammer! Excellent article! Not only applicable to all that’s going on in this country today, but to a lot of what’s going on in individual lives. Thanks for the reminder. I needed that. Maureen, I figured that what I had found to be true would likely be true for others. As a creative option, you could easily do a series of historical, researched novels in your style with basic moral grounds people are starving to hear. If the Lord guides and your heart follows… One of my things- http://heavensees.wordpress.com Best to you.